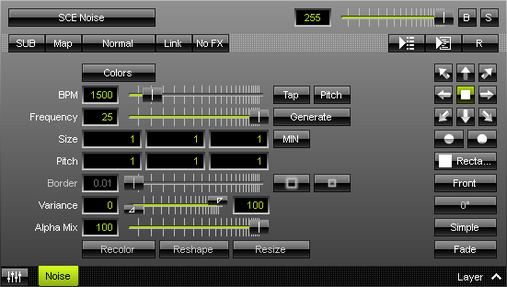 SCE Noise displays by default objects with different shades to create an effect that is often referred to as visual noise. ▪ BPM - Defines the speed [when using a direction/movement]. The default value is 1500. Valid values range from 0 to 9999. ▪ Frequency - Defines the rate at which new visuals are created [in Hz]. The default value is 25. Valid values range from 0 to 50. ▪ Size - Defines the size of objects [Width, Height, Depth] [in % of the Matrix Size]. The default values are 1, 1, 1. Valid values range from 0.01 to 1000. ▪ Pitch - Defines the distance between objects for all 3 axes [in % of the Matrix Size]. The default values are 1, 1, 1. Valid values range from 0.01 to 100. ▪ Border - Is only available for 2D outlined shapes or 3D unfilled shapes. Defines how thick the outer line [border] of objects is. The default value is 0.01. Valid values range from 0.01 to 100. ▪ Variance - Refers to the colors that are specified in the Color Table. Defines the minimum and maximum color variability of colors and objects, i.e. shades [in %]. The default values are 0 and 100. Valid values range from 0 to 100. ▪ Alpha Mix - Defines the upper limit of how much alpha is added to each object [in %]. Alpha Mix will be visible when using additional Layers. The default value is 100. Valid values range from 0 to 100. Recolor - Is only available when setting up at least 2 colors in the Color Table. Assigns a new color to an object every time the effect is generated anew; either automatically via the Frequency or manually via Generate. Reshape - Is only available when using the Shape Random. Assigns a new, random Shape to objects every time the effect is generated anew; either automatically via the Frequency or manually via Generate. Resize - Is only available when setting up a Minimum Size that is lower than 100 [0 to 99]. Assigns a new, random Size to objects every time the effect is generated anew; either automatically via the Frequency or manually via Generate. Minimum Size - Refers to Size. Defines the minimum size of objects [in %]. The default value is 100. Valid values range from 1 to 100. Shape - Allows you to choose a specific shape for objects. A certain Size is required before a shape becomes visible. The default Shape is Rectangle Filled. Fade - Activates or deactivates fading between colors.